Softener 32K and Upflow carbon 1 cubic Ft Filtration & drinking water system. 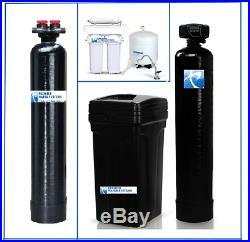 Whole House Water Treatment Package. 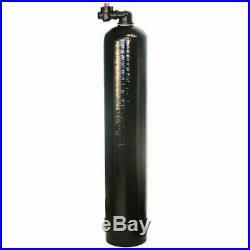 Water Softener 32,000 Grain (9″x 48″). Upflow Carbon Filtration (1 Cubic Feet). Reverse Osmosis Drinking Water System. Complete turn-key package for Pure and Soft Water: PERFECT for NEW HOMEOWNERS. This Package combines a Whole House experience of Water Softening & Carbon Filtration for the cleanest and softest water from every tap of your home. This is package provides the most value when compared to the market. 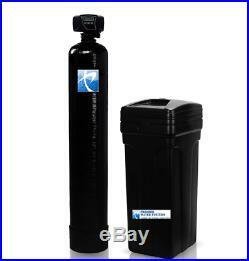 WATER SOFTENER OVERVIEW – Complete whole house system. Controlled by the popular Fleck digital valve meter. 64000 grain high capacity softening system uses an UPGRADED 10% Cross-linked resin for longer life. Best quality in the Industry. Recommended Service Flow up to 12 GPM (Household sizes of 4-7 people). UPFLOW CARBON FILTRATION Eco-friendly upflow design provides efficient filtration without the need to backwash. No backwash means no electricity required, no drain line needed, and no wastewater produced. Greener water filtration and cleaner, safer water is a breeze with our carbon tank filter system. High Activity Carbon Media – Carbon media is a natural media derived from coconut shells that removes water contaminants through absorption. UPFLOW CARBON CONTAMINANT REMOVAL Removes a wide range of contaminants including chlorine and chloramines, pesticides, herbicides, organics, MTBE, and THM. 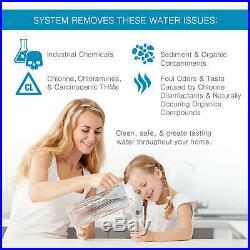 It also removes most other chemicals, tastes and odors, and is an excellent system for general filtration. 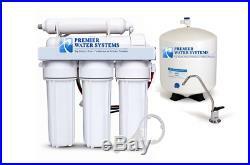 Drinking Water System: 4-Stage Reverse Osmosis Under-sink Water Filtration System. Best quality and tasting drinking water! This system comes with the following 1 Softener 9″x 48″ Tank: 10% crosslink resin, 1 Cubic Foot Pre-loaded 1 Fleck control meter digital valve 1 bypass 1″ Stainless steel 1 brine tank (note the tank could be round or square) 1 9″ x 48 mineral tank with Coconut Shell Carbon. 1 Cubic Foot Pre-loaded. 1 upflow valve set with bypass and adapter. 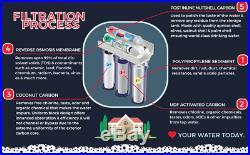 1 -5 stage Reverse Osmosis Drinking Water Filtration System. Please feel free to send us a message if you have any questions, or would like to customize this or any other systems we have to fit your needs! Uncompromising Quality Water Systems. We have years of experience crafting our solutions for specific water sources in California. Our whole house water systems is designed to give you the best water quality from every faucet in your home. Setting ourselves apart from the competition, we use a three stage water system to clean, soften, and purify your water. 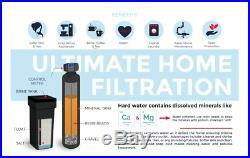 A whole house filter, softener, and a reverse osmosis system. WEEKEND BY APPOINTMENT ONLY. Get Supersized Images & Free Image Hosting. Create your brand with Auctiva’s. Attention Sellers – Get Templates Image Hosting, Scheduling at Auctiva. Track Page Views With. Auctiva’s FREE Counter. The item “Whole House Water Package Softener + Carbon Filtration + RO System 1 Cubic Ft” is in sale since Thursday, January 18, 2018. This item is in the category “Home & Garden\Kitchen, Dining & Bar\Small Kitchen Appliances\Water Purification\Water Filters”. The seller is “dhillonnoni” and is located in Canyon Country, California. This item can be shipped to United States.